From routine dental exams, dental X-rays, dental cleanings, filling cavities, and minor dental surgery to more advanced procedures such as dental implants, wisdom extraction, root canal, crowns and other cosmetic and restorative dental procedures. Implants are the next best thing to your own teeth. 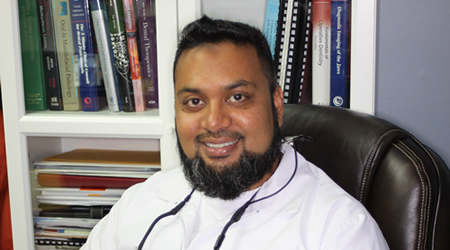 Dr. Rana specialize in dental implant from start to finish, right here in our office! Dr. M.I. Rana has been practicing dentistry in the Toronto area for over 15 years and focuses on providing you and your family the best dental care. Dr. Rana specialize in Implant, Bone Grafting, Root Canal, Gum Treatment, Wisdom Extraction, Crown, Bridge, Fillings and more. Current offer include Teeth Whitening, Sports Guards and Snoring Guards.